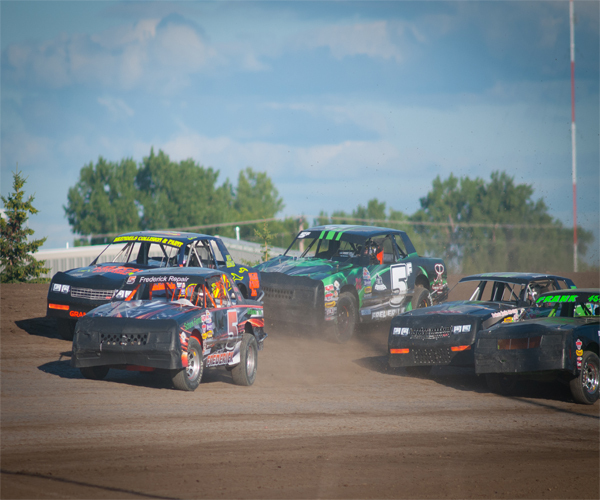 Fans got their moneys worth on Championship night of the North Dakota Governor's Cup at the Dacotah Speedway on July 27. After two Hobby Stock concys, three IMCA Modified concys and one WISSOTA Street concy, it was feature time. The Hobby Stock feature was the first feature of the night. 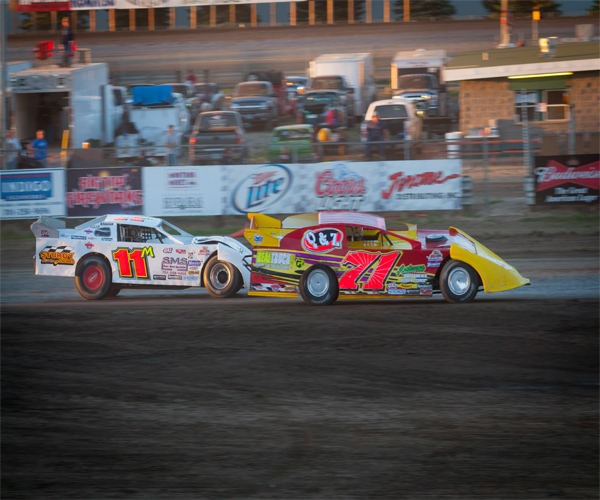 The winner of the 20 lap feature would be crowned one of six 2013 North Dakota Governor's Cup champions. Young Scott Gartner started on the pole since he won the Hobby Stock dash for cash the night before. However, outside pole sitter Chad Hausauer quickly stole the lead away at the start. A caution on lap six, allowed Bottineau's Clint Patterson to slip by Ron Joern for third on the restart and set his sights on second place Gartner. Patterson passed Gartner on lap nine, bringing Joern with him. Patterson continued to march to the front, challenging Hausauer for the win with eight laps to go. Hausauer hung onto his lead as Patterson began to drift back into the clutches of third place Joern. Joern raced side by side with Patterson but got too high in turn two, opening the door for Gartner to slip by with five laps to go. A caution with three to go set up a green white checkered restart. Hausauer had a great restart as he pulled away but not the case for Joern who got bumped from behind and lost all of his track position. Gartner passed Patterson with two to go, bringing Ryan Romans with him. Gartner gave it once last shot for the win but Hausauer held him off for the feature victory. Romans edged Patterson at the finish line to finish third and John Gartner Jr rounded out the top five. A special 12 lap IMCA Sport Compact feature took the track next. Rookie Nic West started on the pole along side Josh Roehrich. Third place Jamie Schlafmann battled West for the lead at the start of the feature. Schlafmann took the lead and immediately pulled away from the competition. Track points leader Derek Nitschek passed West for second and it was a battle for third as West tried to hold off Roehrich. Roehrich blew by West on lap five and quickly reeled in second place Nitschke but got squirrelly racing for secon d, losing third back to West. With three laps to go, Cody Schulz spun in turn two and bringing out the caution which was not what Schlafmann wanted to see. On the restart, Schlafmann pulled away again as Nitschke and West battled side by side for second. Coming to the white flag, Schlafmann's car abruptly slowed in turn three and suddenly it was a battle for the win between Nitschke and West. Third place Roehrich took it three wide on the final lap and coming out of turn four, West bumped Nitschke racing down low, who in chain reaction, bumped Roehrich off the track. As they crossed the Open Road Honda finish line, Nitschke just narrowly edged West for the win. Michelle Stoxen finished a season best third place ahead of Scott Hagemeister and Alex Thompson. After the conclusion of the feature, race officials charge the last lap contact on West, giving Roehrich the second place finish. Despite crossing the line second, West finished 10th. Ivan Sailer led from the start of the INEX Legends feature. National champion Donavin Wiest used the low line around the guardrail to inch into the lead by lap two. Sailer slipped to fourth as Drew Papke and Troy Hoff passed him before a caution on lap five regrouped the field. Steven Kuntz, who started 12th, challenged leader Wiest on the restart and took the lead on lap eight. Wiest rallied back and they raced side by side for position. A series of late race cautions gave Wiest plenty of opportunities to retake the lead but he couldn't get the momentum to complete the pass. On the final restart with eight laps to go, Kuntz and Wiest pulled away. Fourth place Papke was all over third place Sailer's bumper and as they raced for third, Papke got passed by track points leader Shane Williams. As they raced off turn four and to the checkered flag, Williams held off Papke by half a car length to finish fourth. Sailer finished third behind Wiest and feature winner Steven Kuntz. Cave City, Arkansas's Jeff Taylor started on the pole for the IMCA Modified feature but was quickly passed by Mandan's Jeremy Keller and Minot's Robert Hellebust. As Keller and Hellebust battled for the lead, Taylor forced it three wide but got loose and spun on his own, bringing out the caution and going tail on the restart. Keller pulled away on the restart, leaving Hellebust and Marlyn Seidler racing hard for second. Seidler wasted no time and took second from Hellebust but Keller was long gone. Keller started lapping cars just 15 short laps into the 30 lap feature. However, Keller had a difficult time navigating through the lapped traffic allowing Seidler to quickly catch him. As Keller tried to lap the slow car of Mike Nelson, Seidler over drove turn two, spinning Nelson and collecting leader Keller. The caution was charged on Seidler and when he did not go to the tail of the field, he was black flagged and his night was over. Hellebust inherited the lead and on the restart, he pulled away from Shawn Strand. 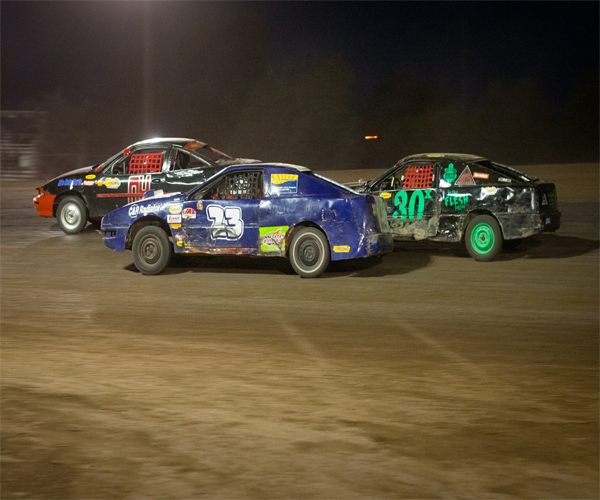 Strand started to fade, getting passed by Drew Christianson, Aaron Turnbull and Tracy Domagala. Strand tried to hold onto a top five finish but Jeff Taylor drove through the 24 car field and passed Strand with nine laps to go. 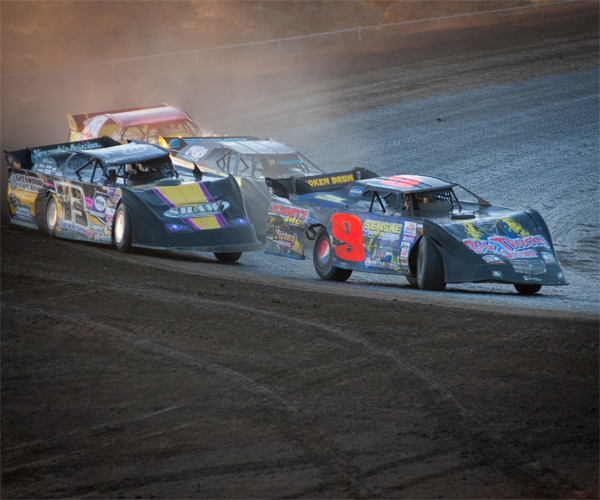 As Christianson, Turnbull and Domagala raced for second, Taylor caught the three car pack. The drivers shuffled around for position as the laps wound down. With one lap to go, Taylor passed Christianson for fourth. Domagala finished third behind young gun Aaron Turnbull and winner Robert Hellebust. Allen Frederick of Richardton quickly took the lead from pole sitter Jeremy Schmidt on the start of the WISSOTA Street Stock feature . Frederick had his hands full with David Falkenstein all over his back bumper. 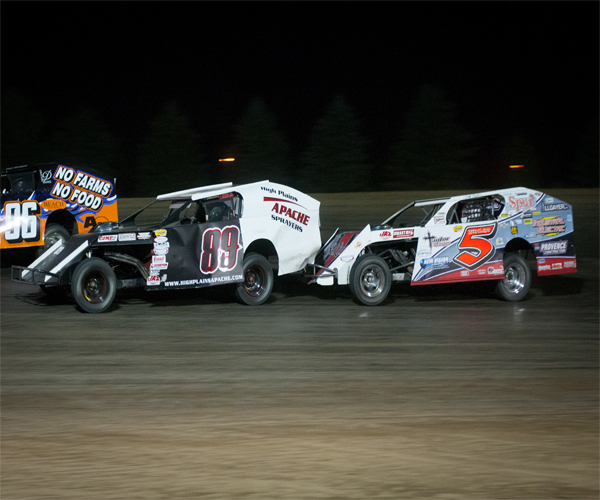 The two drivers raced side by side as Shawn Volk tried to hold off a fast Eric Paul for third. Paul passed Volk on lap five and challenged Falkenstein for second. Falkenstein and Paul raced side by side for three laps while Frederick pulled away. A lap 10 caution regrouped the field and put Falkenstein and Paul on Frederick's rear bumper. On the restart, fifth place John Fiest clipped fourth place Volk and sent him spinning off the backstretch. Falkenstein and Paul continued their side by side battle on the restart but a series of late race cautions bunched the field back up. On the final restart of the feature, Frederick pulled away once more. Fourth place Zach Frederick was lurking behind Falkenstein and Paul and with three laps to go, Zach Frederick made his move on Paul. Zach Frederick held off Eric Paul to finish third. Falkenstein finished second behind winner Allen Frederick who led all 25 laps to win. Eric Harpole finished a season best of fifth place. In the final feature of the night, local favorite Jeremy Keller started on the pole for the Late Model feature. Outside pole sitter Zach Johnson quickly raced into the lead before a lap one caution regrouped the field. On the restart, Keller slipped to fifth, losing spots to Steven Pfiefer, Pat Doar and Mike Balcaen. 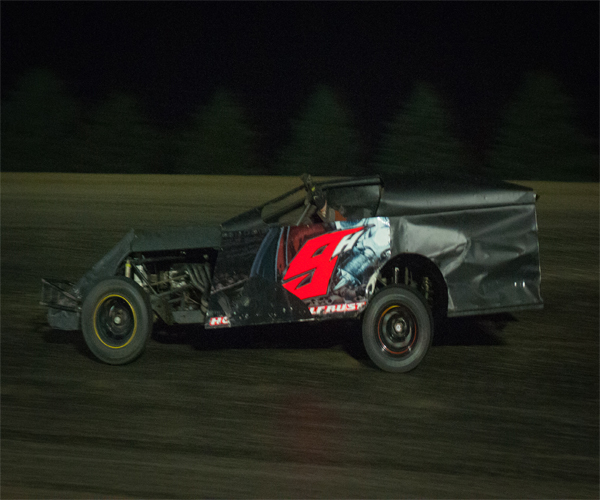 The second caution of the night was for leader Johnson who spun trying to avoid the wrecked car of Cody Storbakken. Johnson restarted in the lead but lost the le ad to a storming Pat Doar with 18 laps to go. Doar had to survive six cautions in the final 18 laps. With three laps to go, the final caution of the night bunched the field up one last time. It was Pfiefer's and Johnson's last chance to steal the feature win away. However, the high line was the fast line and on the restart, Doar pulled away. Doar led the final 18 laps uncontested to win the feature. Steven Pfiefer finished second ahead of Johnson, Keller and Dave Smith. Johnson's third place finish was enough to win the North Dakota Governor's Cup Championship over Jeremy Keller. Up next, the Dvorak Motors “Monster Truck Night of Thrills Spectacular. Because of overwhelming response, the event has been expanded to two days! Friday, August 2nd and Saturday, August 3rd starting at 7:30pm both nights. Front gates open at 5pm. Both shows are rain or shine. Monster Trucks scheduled to appear include, Larry Quick in Ghost Rider - the first monster truck to ever do a complete backflip. Also El Loco Hombro, Monster Patrol, Riptoid, Robo Machine and Get R' Done. 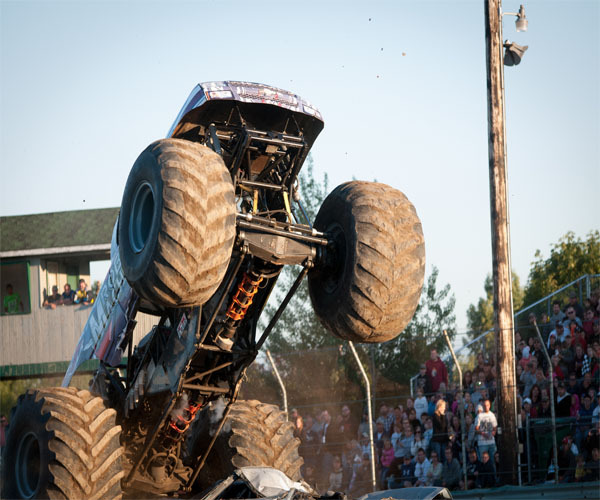 Friday's show features all 6 Monster Trucks, Hollywood Stunt Show, Tuff Trucks, Jet Fire Truck and Outlaw Demolition Derby. 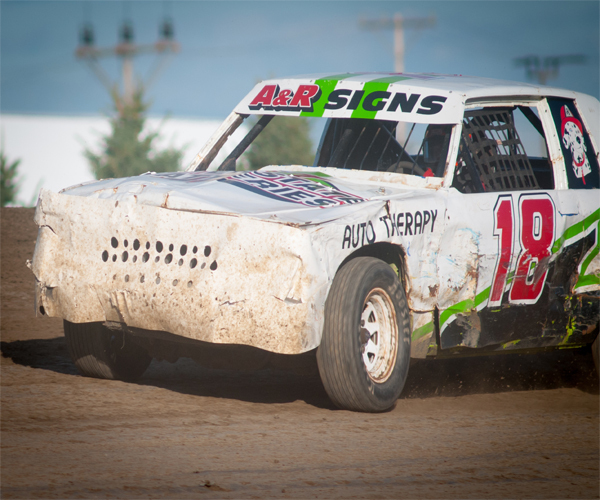 Saturday's show features all 6 Monster Trucks, Tuff Trucks, Hollywood Stunt Show and Trailer Races. Advance tickets are available at Mandan and Bismarck Cenex locations only. Adults 13 and older $18, students 3-12 years old $10 and under 2 are free. Advanced tickets purchased will work for either Friday or Saturday's show. Day of show, tickets are $20 for adults 13 and older, $15 for students 3-12 years old and under 2 are free. Tickets will be on sale at all Mandan and Bismarck Cenex locations till 5pm on Friday, August 2nd. 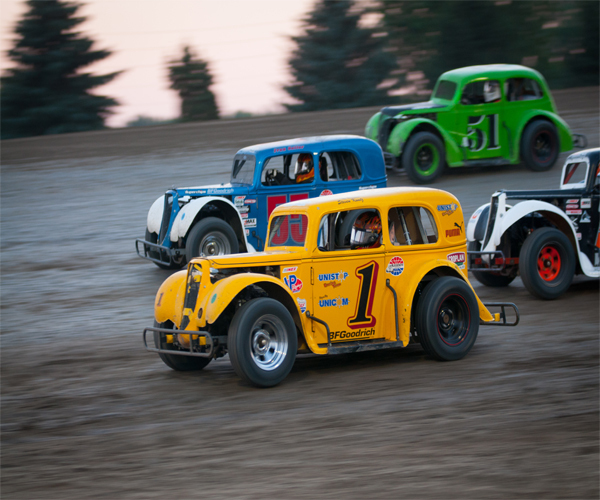 Tickets will be on sale at the Dacotah Speedway ticket office starting at 5pm on Friday, August 2nd. Dacotah Speedway ticket office opens at noon for the Saturday, August 3rd show. Front gates open at 5pm for both Friday and Saturday's show.